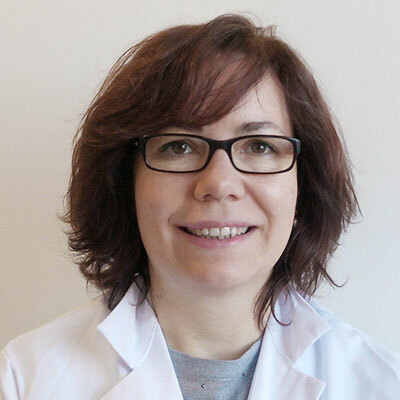 Dr. Elisa Varela is the Principal Investigator of the Telomeres and Telomerase in Reproduction Group at FIVI-IVIRMA, Madrid, supported partly by a Torres Quevedo Contract. She obtained her Ph. D. in Biological Sciences, at the Autonomous University of Madrid in 1998, under the direction of Dr. M.J. Martínez, where she learned biochemistry and molecular biology, working with fungal enzymes involved in wood degradation. In 1999, she joined the laboratory led by Dr. M. Tien, at Pennsylvania State University (State College, PA, USA) as a postdoctoral fellow to learn the chemistry of free radicals and reactive oxygen species that attack wood. During these years she had frequent contact with the laboratory of Dr. J. Workman, who was working on chromatin remodelers, directing her attention to the field of chromatin regulation and dynamics. In 2004, she returned to Europe and joined the laboratory of Prof. S. M. Gasser, in Switzerland, as a postdoctoral fellow. She analyzed the mechanisms that coordinate chromosome decompaction with exit from mitosis and the re-localization of chromatin (rDNA and telomeres) to reform the architecture of functional postmitotic nucleus. During this period, she collaborated with Prof. S. Esposito, studying the transition from the first to the second meiotic division. She also visited the laboratory of Dr. F. Uhlmann in London, with an EMBO Short Term Fellowship. She mastered yeast genetics, cell biology and high resolution confocal microscopy. In 2009, she came back to Spain as staff scientist in the group of Dr. M. A. Blasco to continue her work with telomere dynamics and regulation in cancer, aging and the biology of stem cells, in the context of mammalian organisms. Dr. Varela has collaborated with several outstanding scientists and published several original articles, most of them as first author, in high impact journals such as EMBO, PNAS and Nature Communications. She has participated as investigator in competitive projects funded both by the Spanish Government and the European Union. Dr. Varela has been involved in teaching, taking part as a Faculty in the Masters Program of Molecular Genetics, organized by Universidad Autónoma, Universidad Complutense and Universidad de Alcalá de Henares, since 2014 and other seminars related to telomeres and organismal fitness and health. She has been invited to give talks in international meetings and has been an active member of several Scientific Societies. A Glenohumeral joint model for rehabilitation exoskeleton SOFI. Clinical trial and results. IEEE Systems Journal, 14 (under review). 2017. Appl. and Env. Microbiology, 69: 6025-6031. 2003. Culture conditions affecting biodegradation components of the brown-rot fungus: Gloeophyllum trabeum. A cross-talk between hypoxia and TGF-? orchestrates erytropoietin gene regulation through SP1 and SMADS. J. Mol. Biol., 336: 9-24. 2003. Progress in biopulping of non-woody materials: Chemical, enzymatic and ultrastructural aspects of wheat straw dlignification with ligninolytic fungy from the genus Pleurotus. FEMS Microbiol. Rev., 13: 265-274. 1994.